Miami is still well behind the curve when it comes to Japanese noodles.While I understand that a steaming bowl of ramen can be a tough sell when it seems like it's 90° for nine months of the year, there are other options, some of which are even weather-appropriate. 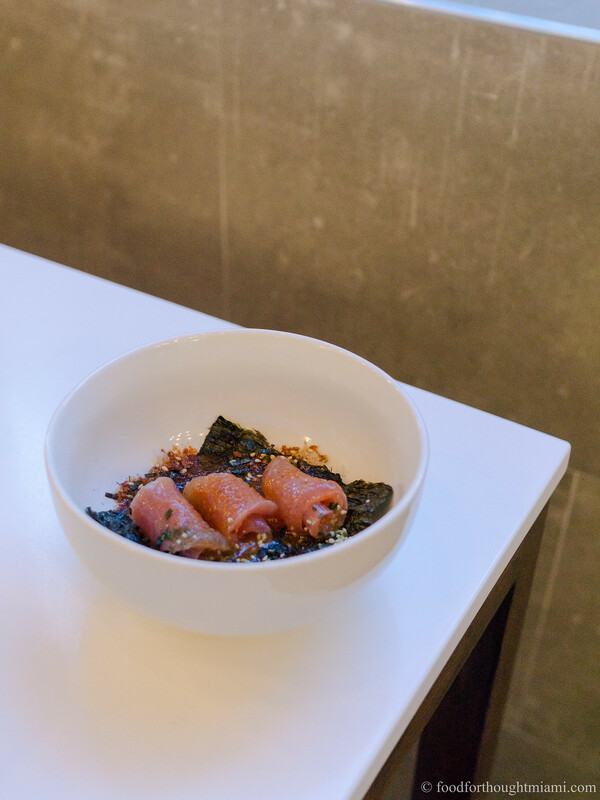 Like soba noodles, which are often served cold with a dipping sauce on the side. 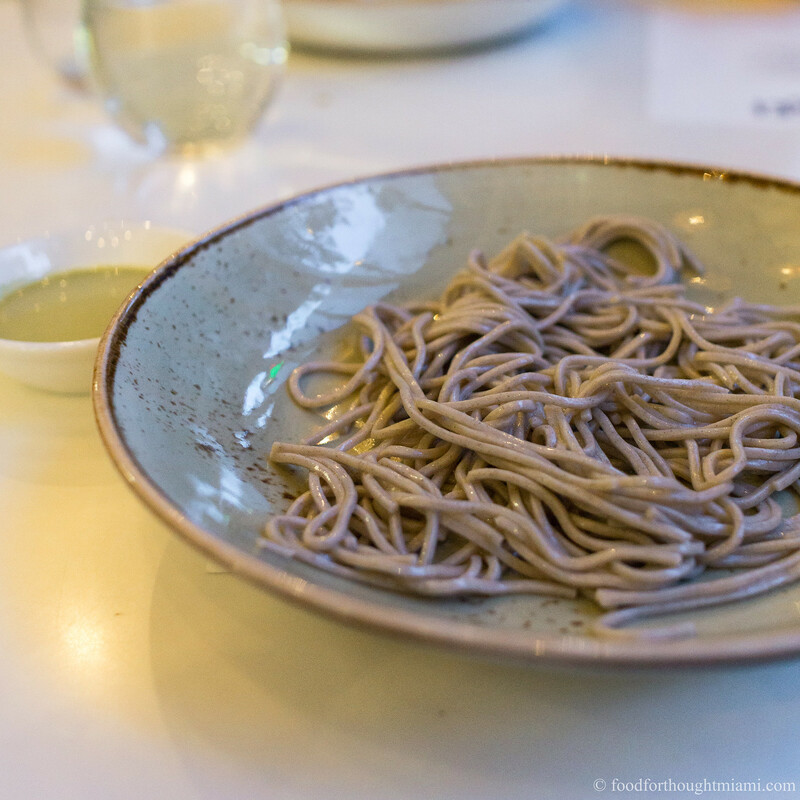 Here, the slippery buckwheat noodles were served with a tangy, refreshing leche de tigre (the aggressively citrusy marinade used for ceviche) loaded with cilantro. I don't know how chupe, a Peruvian seafood chowder with a somewhat unlikely combination of ingredients, came to be. But I know that I like it. The typical components are a seafood stock, spiced with aji amarillo and maybe some other chiles, enriched with evaporated milk, loaded with shrimp or other seafood, and studded with peas or lima beans, cubes of queso fresco, sometimes a fried egg. Chang's version has those delightfully squeaky cubes of fresh cheese, subs edamame for the peas, adds some delicate enoki mushrooms and disks of braised daikon radish, and best of all, crowns everything with a couple fat, sweet head-on shrimp. The broth has a whiff of the sea and is simultaneously creamy and spicy, like a long-lost cousin of the Thai tom kha goong. 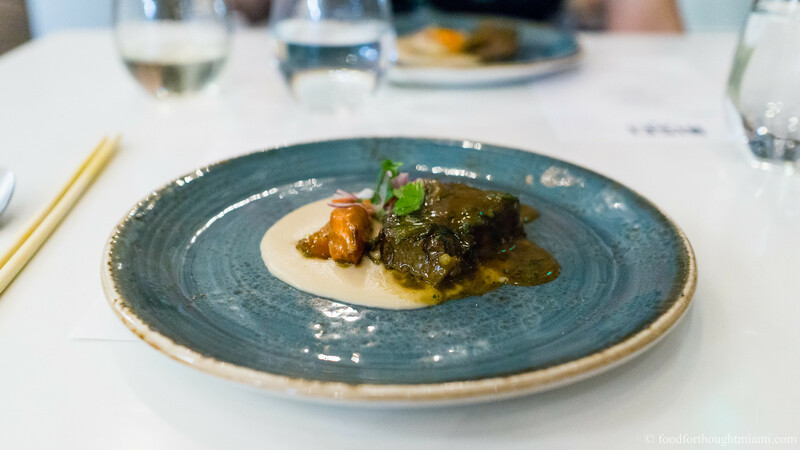 The last savory course introduces Japanese curry beef to Peruvian seco de carne, a cilantro-enriched beef stew. It's served over a velvety white bean purée, along with a couple sweet roasted carrots. It's delicious. 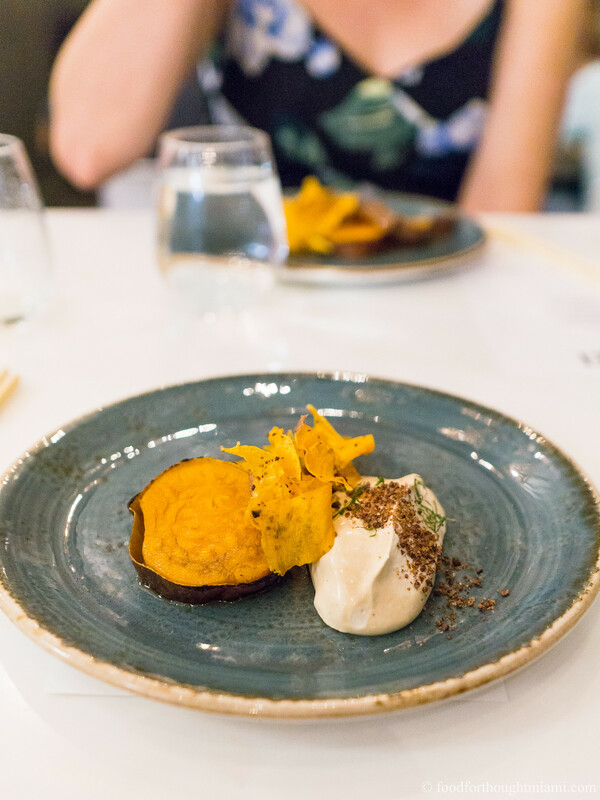 Sweet potatoes make their way into both Japanese and Peruvian desserts. In Japan, there's daigaku imo (and if you haven't seen "Cooking With Dog" yet, you owe it to yourself to click that link); in Peru there's picarones, doughnuts made with sweet potato. 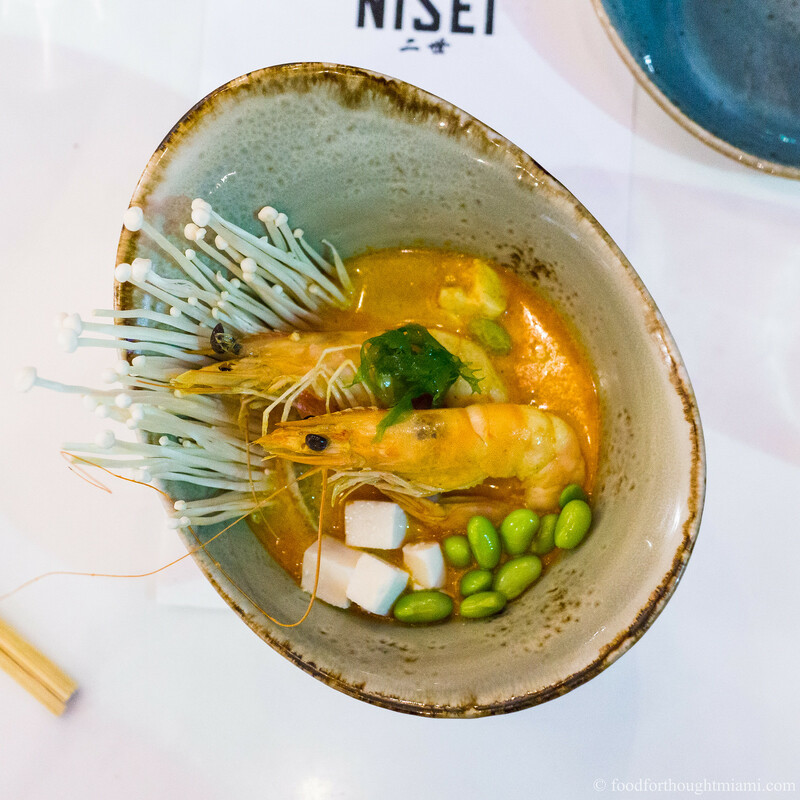 At Nisei, there's simple but honey-sweet rounds of roasted sweet potato, plated with wispy ribbons of fried sweet potato and a mound of burnt miso cream that's dusted with a powder of chancaca (unrefined sugar), cocoa nibs, lime and mandarin zest, which brings a complexity to the tuber's earthy sweetness. 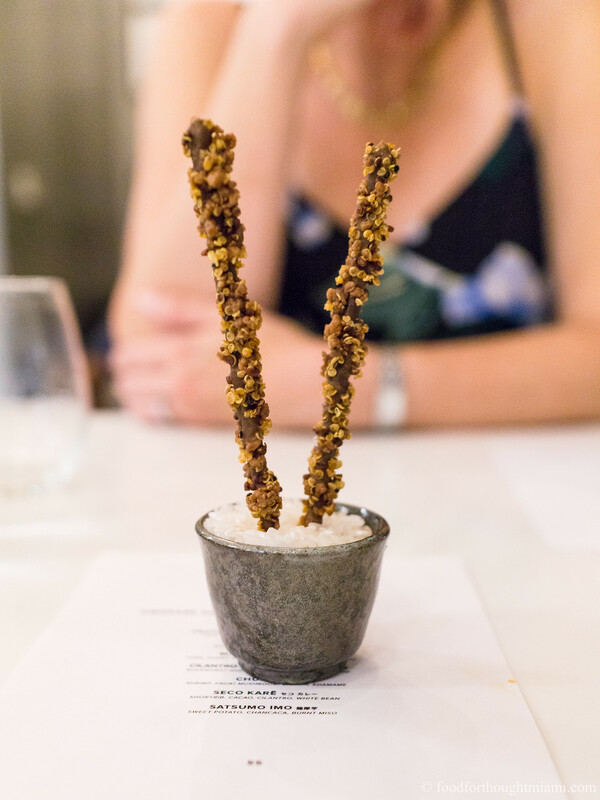 For a final, thematically appropriate send-off, some home-made Pocky sticks, coated with chocolate, nutella and crispy quinoa. People's hackles tend to go up when they hear the word "fusion" mentioned, and for good reason: many a culinary crime has been perpetrated in its name. But Peruvian and Japanese cuisines have already happily co-existed in Peru for over a hundred years, so this isn't that big of a stretch. 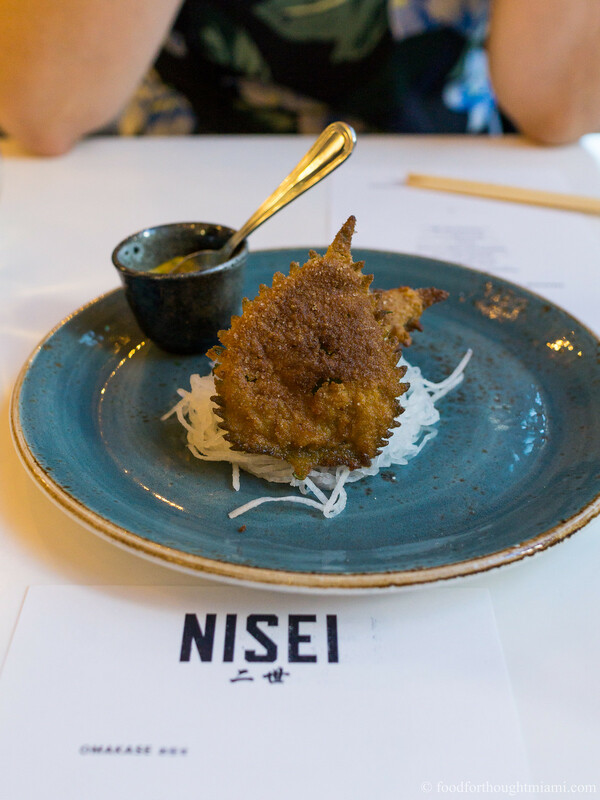 At Nisei, that co-existence takes some intriguing new forms. And more important, it's being achieved with some finesse and balance. 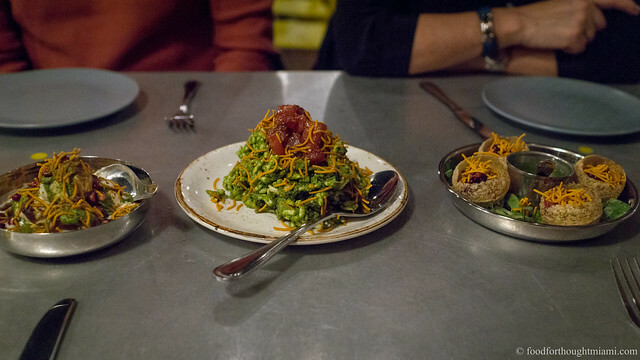 That balance skews more towards the bold flavors of Peru than the subtlety of Japan, but in a good way that highlights rather than overwhelms the ingredients. At $55 per person for a seven-course dinner that was just the right amount of food (Mrs. F didn't leave too stuffed, I didn't leave ready for a second dinner), this is about as good a tasting menu value as you will find in Miami. 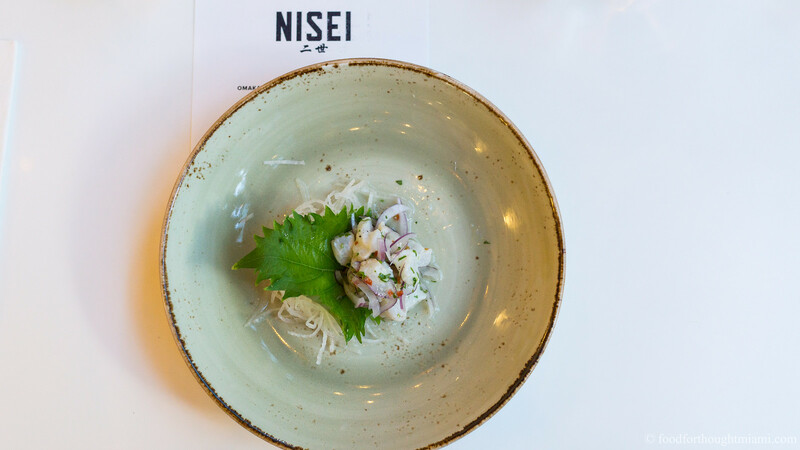 Nisei will be back at B Bistro + Bakery this weekend for another round, and there are still spots available both Friday and Saturday night. You may want to move on that soon. Formerly known as Bachour Bakery + Bistro before a split with its namesake pastry chef Antonio Bachour. A bunch more folks are chipping in as well – Nando's sister Val Chang (currently at Dizengoff and formerly at Paradigm Kitchen), Sasha Ariel (last at 27 Restaurant and Zak the Baker), they even got dmo305 working front of house! And so, full disclosure, yes, many of these folks are friends, and some of my favorite people in the business. I grew some of these lemon drop peppers last season and they have a delightful citrusy note on top of the capsicum heat. I'm looking forward to trying this menu this weekend. But these pictures though...wow! Fabulous!